That 90's Tex-Mex craze served in sizzling hot skillets at your local TGI Fridays and Bennigan's? Every chain restaurant back then served this impressive entree with a side of tortillas, guacamole, salsa and sour cream. I was easily impressed back then. The "Blooming Onion" and "Death by Chocolate" were also favorites of my youth....helping me gain the "freshman 15". My, how times have changed. No thanks to any of the food mentioned above. 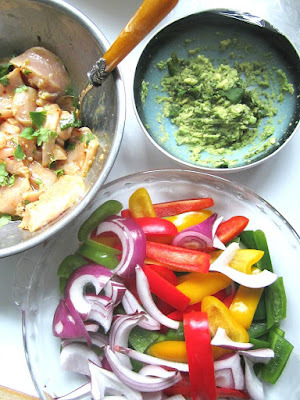 But I'm not sure why fajitas fell out of fashion....they are easy to make, healthy and kid friendly. The perfect weeknight meal. Grab your cast iron skillet and let's go. Slice the chicken breasts into thin strips and add the marinade in a bowl. Marinate for a few hours in the spices and lime juice. When ready to cook, heat up a heavy cast iron skillet w/ the oil. Sear the chicken a few minutes then remove to a bowl w/ tongs. Now add in the cut up vegetables and cook until charred, about 10 minutes, moving the peppers and onions around. Add the chicken back into the skillet with the vegetables and cook another 2 minutes. Fill warmed tortillas (microwave 45 seconds) with the filling. Top with guacamole and salsa and dig in! I do remember to make this once in a while and the hubs devours it! Thanks for the reminder. I do remember Marcel Desaulniers' version of Death by Chocolate - so delicious (pre-Celiac days). Great reminder of an old fave, will use this as a base for dinner tonight. Thanks for the reminder...I don't know why I havent made these in years either. I have peppers, onions and chicken breast, so I am in business. Stacey to the dinner rescue. Thank you. What a great idea for dinner tonight! I haven't made these in ages and they are so good and easy! Thanks for the idea! That's exactly how we make them. I am in Texas, so fajitas have never gone out of style here:) It's in the "quick meals" category because they are so easy and everyone loves them. We prepare them with beef or pork as well, the same method. Stacey, thanks for the delicious recipe! 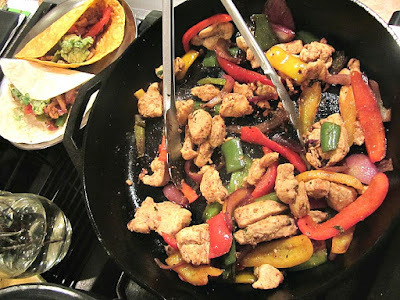 I made the fajitas tonight, and my wife loved them. I thought two peppers would be a lot, but it turned out that we could have added even more vegetables.